A suburban city in the Greater Toronto Area (GTA), Brampton is situated in Southern Ontario, and prides on its lovely landscape, beautiful architecture, a number of entertainment and cultural sights nearby, wonderful people and its closeness to Toronto and Brampton-Caledon Airport. You can explore this town in the “black car near me”, a part of our remarkable fleet. VIP limo 4you has very affordable rates, making limousine rentals in Brampton a treat intended for everyone. Located just 8 miles north of the City of Brampton, Caledon Airport is one of the most visited airports in the area. On that note, airport transfers Brampton are organized on our client’s demand whenever an “airport limo service near me” is needed. VIP limo 4you will offer you a range of car options to choose from and pick one that’s best suited to your needs, the number of people tagging along and your return date. Enjoy riding Brampton limousines such as Mercedes-Benz S-Class, Lincoln MKT, GMC Yukon, Cadillac Escalade, BMW 7 Series, or Cadillac XTS for the best airport transportation experience. Obsessed with exploring Canada’s Wonderland? Well then, pack up your essentials and head towards this spectacular amusement park! If you are considering taking a bus from Brampton to Canada’s Wonderland, maybe you should re-think your options. Listen to this: why not treat yourself to a VIP limo 4you special and book a limo service in Brampton to begin your adventure in style! 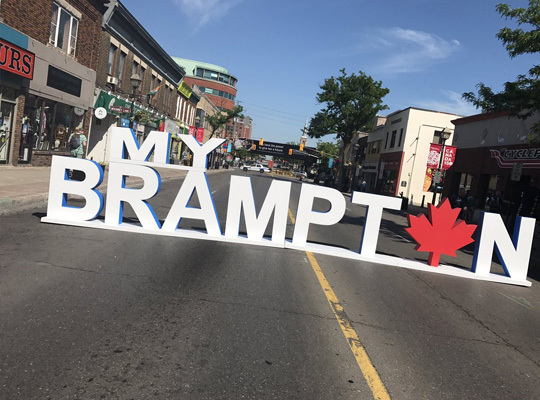 Grab your Brampton Canada map and show your driver where to! Some of the most popular Brampton attractions to enjoy are Brampton’s Great War Flying Museum, Wet’n’Wild Toronto and its whopping 15 water slides, the Peel Art Gallery, Museum and Archives (PAMA), the only open-for-public historic house in Brampton – Bovaird House, the Canada’s 7th-largest mall Bramalea City Centre – a true bliss for all the shopaholics, and many many other options. Basically, no matter where you want to go, VIP limo 4you team will make it happen. Your Brampton-based adventures along with your Brampton transit to Canada’s Wonderland will be best handled by your favorite limousine team, that’s a guarantee. Just… don’t forget to bring your bathing suit, some money and a camera, okay? And here’s a delicacy for everyone: apart from this fantastic airport limo service Brampton, our team thought of treating you to other options as well, such as night out limo Brampton offers, perfect for painting the town red with your local friends or out-of-towners, a wedding limousine Brampton designed for your Big Day and a corporate limousine Brampton – intended for your most successful rides. There’s also the option of booking a limo to visit the nearby GTA towns: anything from Ajax Limo, Brampton Limo and Oakville Limo to Limo service Newmarket and Vaughan is at your disposal. With approved great service ethics, best rates guaranteed, fantastic chauffeur service and an admirable flexibility – you’ll love riding with VIP limo 4you.